Learn to become aware in your dreams and control them to have fantastic adventures while you sleep! Lucidity is a dream journal application designed to keep your dreams organized and help you realize when you are dreaming. Write out your dreams when you wake up and read them later to refresh your memory about the details of them. - Dream journal where you can name, describe, categorize, and rate your dreams. 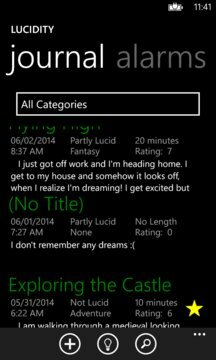 - Length slider for your entries to tell how long the dream felt like. - Keywords that you can tag onto each journal entry of important details in your dreams. 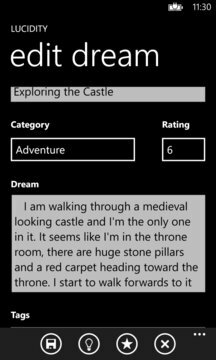 - Tags list designed to collect the separate tags from all the entries and count them so you can see what you dream about most. - Dimming button on the app bar with a slider in the settings to vary the brightness so it is not as intense when in dark lighting. - Three different levels of lucidity for each entry to note how aware you were in the dream. - Favorite icon for your most fun dreams. - Option to manage your dream journal and export/delete multiple dreams. - References that will give you the basic details of what lucid dreaming is and how to achieve lucidity. - Settings page to change how your journal and tags are sorted, add reality check reminders, or change dimmer brightness. - Ability to search for journal entries based on key words. - Filter to display your journal entry list by type of category. - Alerts during the day to remind you to perform your reality checks. - Alarm to play alerts during the night at typical dream times that can possibly help you become lucid. - Statistics page for quick data about your journal entries. - Password protection for the app.